Since after a major update from google roll out to nexus devices,changing almost all aspects,fluidity from Android jellybean all the way upto Android lollipop,it's a major head out turn or shall we say awesome change to a Major Software platform:- Android.So we also know that Motorola is bummer when it comes to fast Android updates from their low end devices all the way upto flagship smartphones! Since motorola released updates to their newer devices including Moto G 2nd gen and Moto X 2nd gen,their older devices are now awaiting the highly anticipating lollipop update ! As motorola updates their services app on play store listing the changes available on lollipop update it seems update's on the way! make sure if are owner of moto g 1st gen we highly recommend to update the app. Since a user on XDA posted that he already received the update on his 1st gen moto g,dual sim earlier this week! 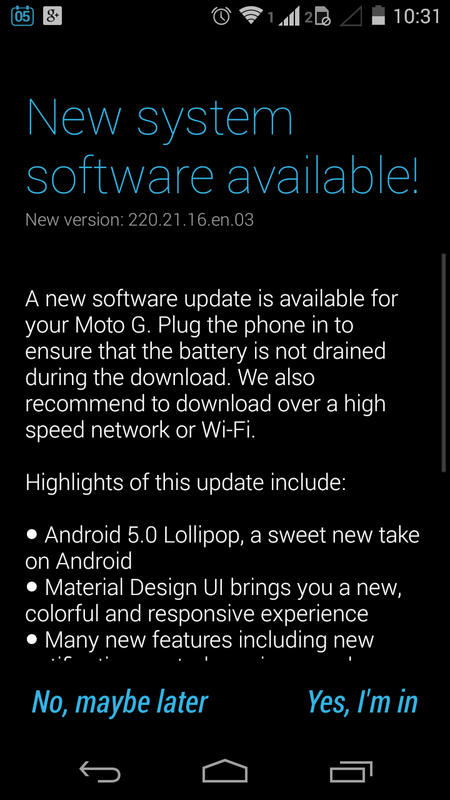 Lollipop update is already rolling out in stages it might land anytime soon on your device,specifically in india if you own one.It might hit other countries soon in stages,sure can check Motorola's official page for updates! Its good to see that Motorola still is more aggressive regarding updates working under Lenovo.Better than with google since much hyped android silver project : android one devices haven't received a official word yet regarding lollipop update! though call google! Wanna get rid of annoying pop-up notifications click here?